Whats On My Food? now tracks bee-toxic pesticide residues alongside the ones with human health implications — and has updated government toxicology data. Other updates include a widget and more intuitive graphics. Note: Our residue data now includes the 2012 datasets, USDA's latest as of May, 2014. …& in our environment, traveling many miles on wind, water and dust. What’s On My Food? is a searchable database designed to make the public problem of pesticide exposure visible and more understandable. How does this tool work? We link pesticide food residue data with the toxicology for each chemical, making this information easily searchable for the first time. pesticides are a public health problem requiring public engagement to solve. 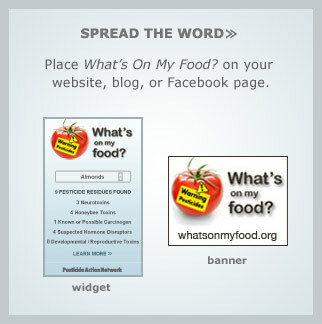 Use the tool, share it with others: we built it to help move the public conversation about pesticides into an arena where you don’t have to be an expert to participate. At Pesticide Action Network (PAN), we believe that pesticides are a public health problem requiring public engagement to solve. We want you to have the information you need to take action based on a solid understanding of the issues. What’s On My Food? builds on PAN’s more than 30-year tradition of making pesticide science accessible.